Many companies choose Los Angeles as their city of choice for fulfillment, warehousing and distribution operations. Here’s why! As global trade continues to change along with fluctuations in the value of the dollar, fuel costs and the variable economy. Los Angeles is amongst one of the top cities that stands out as a true winner in the global logistics game, with several benefits that come with the territory. If you have a large base of customers on the west coast, Los Angeles is the most obvious and best place to locate your fulfillment. Locating your fulfillment here provides the quickest access to customers through multiple modes of delivery. Most fulfillment providers in Los Angeles have the ability to distribute orders rapidly, often the same day to customers and many offer Will Call service to customers who prefer to pick up their orders immediately. In addition, being so closely located to your customer base will save you on shipping costs since everything is shipped within the region and usually within the same postal zone. Los Angeles is the second largest city in the United States. The city is the focal point of the larger Los Angeles metropolitan area and the Greater Los Angeles area region. The area consists of numerous manufacturing and fulfillment facilities stretched out across several communities in the region. Population growth and port expansion are major factors in driving a growing need for investment in the distribution network of this area so you’ll have plenty of centers from which to choose, now and in the future. 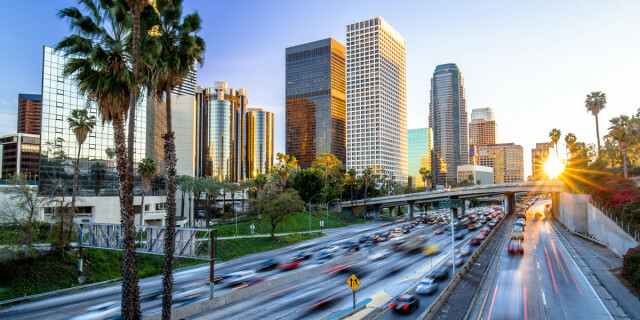 Los Angeles is one of the largest transportation hubs with easy access to several important business centers within the Southern California region and throughout California, Nevada and Arizona. With one of the most highly complex highway systems in the world, trucks run a common and frequent route to and from one of the largest west coast ports, Long Beach and San Pedro area and down the coast to San Diego and up the coast to San Francisco, two other major shipping ports in California. The most heavy freight traffic runs the major highway routes providing intercity connections on Interstate 5 (north to Sacramento and south to San Diego) and Route 101 (north to Santa Barbara) and Interstate 10 (east to Phoenix). As a central hub to so many areas, it is much more convenient to have a vast amount of your supply chain needs met here. The tropical climates in this region make it an easy place to do business year round. The weather lends itself to better climate control warehousing. Fulfillment warehouses are better able to keep costs down in this area because the reasonable temperatures and low humidity reduce the negative impact on storing certain products. Centers in Los Angeles have fewer challenges with environmental factors such as dampness, mildew and mold. Though they still operate in climate controlled environments, this region makes it less of a challenge to control the climates in their warehouses than say an area like New York where winters can wreak havoc during harsh seasons. Los Angeles is in immediate proximity to the country’s largest west coast import gateway, the Los Angeles and Long Beach ports. Import and export shipments come and go from all over the world. It is ranked number 1 in Port-Related Intermodal Sites and it’s sister county, San Bernadino is ranked number 2 in the U.S. in Distribution Logistics Locations. The Los Angeles port imported $21 billion and exported $2 billion in March alone. This area makes it very easy for fulfillment centers located here to receive products from overseas clients. Los Angeles is the most populous city in the world with over 18 million people living in the region. Think of that in terms of the amazing opportunity to grow your business. The Los Angeles combined statistical area (CSA) has a gross metropolitan product (GMP) of over $831 Billion, making it the third largest in the world only after the Greater Tokyo and New York metropolitan areas. Los Angeles provides access to the largest and most rapidly growing consumer base in the U.S. and is poised to capture significant new volume and likely to be a center of innovative logistics activity in the future. The city has experienced new growth in trucking and air and seen dramatic new re-investment in rail, setting up an infrastructure that will lead to increased growth in coming years. Los Angeles has been home to the Summer Olympic Games twice. With strengths in business, international trade, entertainment, culture, media, fashion, science, sports, technology, education, medicine and research it has been ranked sixth in the Global Cities Index and 9th in the Global Economic Power Index. The city is home to renowned institutions specializing in a wide range of professional and cultural fields and has one of the best multimodal connections. Los Angeles serves a highly diverse and multicultural trade community throughout the world with over 224 languages spoken in Los Angeles County fluently according to Professor Vyacheslav of UCLA making it an ideal city to do global business. According to the Port of Los Angeles Marketing Division in San Pedro, California, The Port of Los Angeles is Foreign Trade Zone (FTZ) 202, established in 1994 and comprises approximately 2700 acres of Port property, including warehousing facilities compatible with FTZ operations. FTZ 202 includes General Purpose sites in Los Angeles, the South Bay cities of Carson, Rancho Dominguez, San Pedro, Torrance and Wilmington, and the International Trade and Transportation Center in Shafter, California. In addition, FTZ 202 also comprises of Subzones in the Southern California cities of El Segundo, Fontana, Northridge and Wilmington. This provides several benefits such as Duty Deferral where FTZ users pay U.S. Customs duties only when merchandise is shipped into a Customs territory. Inventory held in an FTZ is exempt from payment of duties until shipped. Duty Reduction, also called “inverted tariff,” allows any FTZ importer or manufacturer to pay the duty rate applicable to either the imported components or the finished product, whichever is lower. Duty Elimination allows FTZ users not to pay U.S. Custom duties on merchandise exported from a FTZ, or on merchandise that is damaged, scrapped or unused. FTZ’s offer users greater flexibility for merchandise subject to just-in-time inventory delivery constraints, quotas or marking requirements. In addition, Customs clearance of merchandise may be expedited through the use of an FTZ. Merchandise may be stored in an FTZ even if the goods are subject to quota restrictions and the merchandise may be shipped when a quota is opened. Choosing to do business in Los Angeles FTZ 202 could result in a significant amount of savings for your company when you add up all the benefits. Los Angeles provides easy access to drayage services. This term is used when a truck picks up from or delivers to a seaport, border point, inland port or intermodal terminal with both the trip origin and destination located in the same urban area. The term drayage is also used for the fee paid for such services. NAFTA and the growth of globalized trade have dramatically increased imports and exports shipped in marine International Organization for Standardization containers. Also, the rise in fuel costs have limited cost cutting options along the supply chain. Although drayage is a very small component in the supply chain in terms of distance and time, its cost and potential problems can be disproportionately high so having access to good drayage services can make a significant impact on your bottom line. In Intermodal freight transport, drayage is the transport of containerized cargo by specialized trucking companies between ocean ports or rail ramps and shipping docks. Distribution centers and container freight stations specialize in unpacking and preparing the contents of the container for delivery in a larger semi-trailer to a final customer such as a retail store. Border dray transfer systems have dray vehicles transport the semi-trailers across a country’s border, principally shuttling back and forth between trucking yards, broker facilities and warehouses. This service can be provided by a national trucking or shipping company or an International shipment brokerage firm. When choosing a fulfillment center, it’s good to start by mapping out where the majority of your customers and suppliers are located and where you want to grow your business. If your customers are located on the west coast, if you’re operating on a global scale, if you want to have more access to shipping options, or just want to expand your business reach, Los Angeles may be the perfect place to locate your fulfillment.